Bio – Brother of Sif and steadfast friend of Thor, Heimdall is the guardian of the Bifrost Bridge and the eternal sentry of Asgard. His vision and hearing are so sensitive that they border on omniscience, allowing him to perceive threats from all across the Nine Worlds. 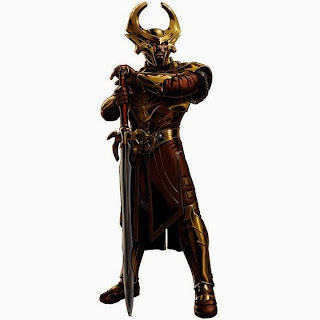 Though statue-like in his demeanor, he is anything but idle, and will not hesitate to use his considerable skills as a warrior to protect Asgard. Malekith the Accursed is the ruler of the Dark Elves of Svartalfheim. His goal is nothing less than to plunge all of the Nine Realms into utter darkness. Algrim the Strong was Malekith's most loyal lieutenant. Abusing that loyalty, Malekith transformed Algrim into the monstrous Kurse, then convinced Kurse that all of his suffering was the fault of one Asgardian: Thor. Our newest lockbox hero is Loki, which can be recruited by completing the Mischievous lockbox collection. Bio – Son of a frost giant, lover of deception and chaos, Loki Laufeyson was always doomed to be an outsider in Asgard. Despite his cunning wit and mastery of sorcery, he remained forever in the shadow of his step-brother Thor. Though Loki crafted many schemes to destroy Thor and usurp the throne of Odin, he failed time and time again. Newly released from an Asgardian prison, he now offers to help S.H.I.E.L.D. in exchange for his freedom. But make no mistake; nothing Loki offers is ever as it seems. You have a chance to receive duplicate covers until you have received a number of duplicates equal to the number of unique covers you currently own IN THAT COLLECTION. Each collection has its own counter and does not influence the chances of duplicates in other collections. Here’s an example below. You open your 6th NEW cover and now have 6 unique covers in your collection unlocked. You only need 2 more covers to unlock Loki. You now have a chance to receive up to 6 duplicate covers before you receive your 7th NEW cover for your collection. Once you have reached 6 duplicate covers, your 7th cover is guaranteed to be new. However, you ALWAYS have a chance to get a new cover. The progress bar we’ve added to each collection page will show you how close you are to a guaranteed NEW cover and hopefully will make it easier to determine how close you are to obtaining the lockbox hero. Of course the example above applies to both opening 1 lockbox and 10 lockboxes at a time, but the chance to open any cover at all when opening 1 lockbox never changes. So be aware that in most cases opening 10 lockboxes at a time will complete your collection faster. Unless you’re lucky! We are rolling out some fun Halloween themed gifts to send to your allies and pick up from their visitation maps. Research complete popups no longer link to the store if the item cannot be purchased. Having Heimdall on the player's team prevents Flanked follow-up attacks. What the hell with Kurse, he is too IMBA..!! Yes!! They finally fixed Black Knight! How many boxes (total) are needed if t makes you max out the bar each time?